HIA Sarajevo Fellow (2017). 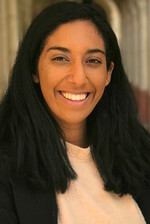 Lydia Ghuman currently resides in Cincinnati, Ohio where she works on creating redemptive criminal-justice systems through education, reform, and advocacy at The Ohio Justice and Policy Center. She graduated from the University of Missouri with a dual honors degree in English and Women and Gender Studies. Lydia also spent her time as an undergraduate being heavily involved in student activism. This lead her to being co-president of Diversity Peer Educators and Feminist Student Union, a site leader for Mizzou Alternative Breaks, campaigning for local elections, and interning at various public representatives' offices. Her strengths are non-profit management, legal advocacy, and grassroots organizing and activism. She plans to attend law school in Fall of 2019.